There is still plenty to play for in these final two games for the Texas Stars, a back-to-back home and home weekend set against the San Antonio Rampage. 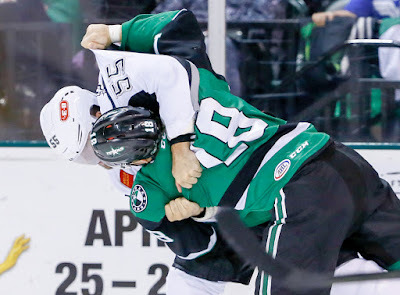 Coming off their dramatic Wednesday night victory in which Travis Morin scored the overtime winner, the Stars have positioned themselves with the potential to move up in the Pacific standings with a chance at home ice in the first round of the playoffs. If the Stars win both games against the Rampage, they can pass the Ontario Reign should the Reign fail to collect more than two points in their weekend games. You can read more about the scenarios here. Heading into Friday's game, head coach Derek Laxdal said the plan was to give the veterans a breather and see what they have in some of the young players. Expect the top guns like Morin, Curtis McKenzie, Jason Dickinson, and others to be scratches. For the Rampage, their season is almost over, but they know they can still play a spoiler role of sorts. Recently minted AHL All-Rookie goaltender Ville Husso will be done for the season, as the Rampage want to split the last two games between Spencer Martin and Adam Werner. They can still find a way to be a thorn in the side of the Stars should they force them into extra travel in the first round. Look for them to give the young Texas lineup all they can handle in Friday's tilt in San Antonio. The puck is set to drop at 7:30 CDT.